This is a series of pictures taken of a Texas Tortoise that I was lucky enough to have witnessed passing through the area. It was much quicker than I expected. Despite what the story says I believe he could have beat the hare out right from the start. Thankfully I was still able to get a hold on the camera and take some photos before he moved on. The notoriously large state is actually home to the smallest tortoise in North America. 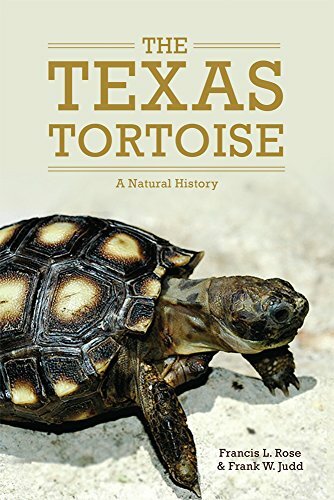 Let me introduce you to the Texas Tortoise (Gopherus berlandieri); one of only four land-dwelling testudines native to North America, and the only one found in Texas. The yellowish-orange, plates called scutes on its shell identify this particular chelonian and they will normally grow to have a shell width of approximately 8.5 inches. They do not have webbed feet like a turtle; instead, their feet are more like those of an elephant; which helps support their weight on land. Although their life span is unknown, it is thought that breeding age is around 15 years, and that it is possible for them to live as long as 60 years. The Texas Tortoise, like the Texas Horned Lizard, is listed as threatened on the Texas Parks and Wildlife Department’s list of Endangered or Threatened animals. It is illegal to move, harm or collect a them from their home in the wild. Individuals have very small home ranges and if one is moved outside of its home range, it will probably die! Over collection by enthusiastic sightseers has contributed greatly to the intriguing creature’s threatened status. They need a dry climate to survive, and when they are toted off to a moister environment, they develop life threatening respiratory infections. These infections are highly contagious to other members of their family and if they are released back into the wild, the infection could wipe out many of their peers. "I Don't Dig, Being a Texas Tortoise"
Unlike the other three varieties of tortoise in North America, the Gopherus berlandieri is not a great burrower. In face, oddly enough for a tortoise, they really don't burrow at all. Instead they may use an existing mammal burrow or prepare a pallet to reside in. A tortoise uses its forelimbs, the underside (gular scute) and edges of the shell to scrape away a pallet. This is what a tortoise would look like on its pallet if it were to be badly drawn by a terrible artist. The Gopherus berlandieri lives in the hot, dry and sandy region of South Texas, and into the Mexican states of Coahuila, Nuevo Leon, and Tamaulipas. The tough reptile thrives in a habitat of dry scrubs and grasslands. The diet of the tortoise is comprised of succulent plants and they really enjoy leaves, stalks and especially the fruit of cacti such as the Prickly Pear, otherwise known as the Nopal cactus. These reptiles, like many, will use urination as a defense. Tortoises get most of their moisture from their food and use their bladder to store water. They will evacuate their bladders as a defense mechanism when handled, which means that the critter loses most of its stored water, leaving it at a high risk for becoming dehydrated. Texas Tortoises have a very low production rate normally only 1-2 clutches per year consisting of only three eggs. With such a small chance at procreation and the illegal pet trade battling against them, these amazing creatures could use some support. If you happen to see one out and about, enjoy it from a distance. Give it a wide berth, snap a picture or two, and you might even want to give your local parks and wildlife representative a call. They will be happy to hear about a tortoise sighting! Interesting article and I love your photos!